ICCNC: Ali Samadpour, composer, expert in Radif, researcher, and accomplished tar and setar player will present four musical eras encompassing five hundred years of Iranian musical history with a focus on analyzing musical compositions and will perform examples of each with vocal accompaniment from Seyed Abolhassan Mokhtabad in Sarbang’s first program of 2017 at the Islamic Cultural Center of Northern California(ICCNC). As a pioneer in a one-on-one, interactive method for teaching traditional music, he will also discuss the elements that make up his particular style of instruction. 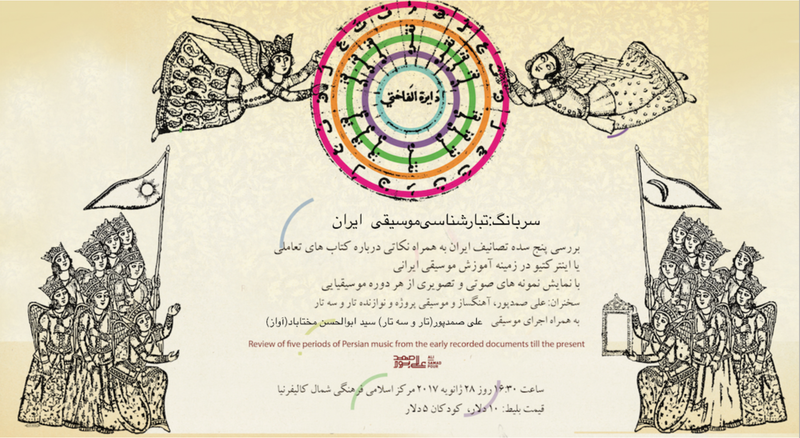 In the main part of the program, attendees will learn about four principal approaches to compositions and melodies in five historical eras: Timurid, Safavi, Qajar both before and after the Iranian Constitutional Revolution, both Pahlavi eras, as well as the current post-Revolution era. For each era, there will be a discussion of the social backdrop, unique songwriting techniques, and putting poetry to music. Finally, he will take a closer look at two exemplary compositions from each era and put on audio and video of performances of music composed in each era. Mr. Samadpour will put on an animation detailing the characteristics of the society of each era in Farsi and English before moving on to his own study of them. Then he will present an analysis of styles of compositions in each period as well as setting poetry to music which will demonstrate the most important elements and attitudes that defined each era’s respective tastes through the compositions they preferred. The event will also include a live performance devoted to one of the eras featuring Mr. Samadpour on tar and setar and vocals by Seyed Abdolhassan Mokhtabad. The event will be held at 4:30 pm on Saturday, January 28 at the Islamic Cultural Center of Northern California. Sarbong is An Evening with music and poetry That by Abolhassan Mokhtabad Researcher in historical Iranian music and journalist of art and culture Will be held the fourth Saturday of every month.